This is how you welcome your 85th season of top notch theatre. An ensemble cast led by Jayne Atkinson and Treat Williams, a set that would give Rubik something to puzzle over, and a plot with more twists and turns than Lombard Street in San Francisco. Sharp, hysterically funny, smart, and brutal is the world of “Lion in Winter” by James Goldman and as directed by Robert Moss. Set during Christmas in 1183, King Henry II and his Queen Eleanor of Aquitane (currently imprisoned by her own family but allowed out on furlough for the holiday), their three sons, King Phillip of France (Matthew Stucky), Phillip’s niece Alais (Tara Franklin),who naturally is also Henry’s mistress, spend their time plotting, scheming and back-stabbing over who should inherit the throne upon the aging King’s death. The Queen adores her son Richard (played with intense ruthlessness by Aaron Costa Ganis), while the King has inexplicably chosen the whining, pimple-faced youngest son John (Carl Gregory) who is more court jester than kingly. Left out in the cold is the unmerciful Geoffrey (Tommy Schrieder). As Queen Eleanor, Atkinson’s ability to thrust a line right into the heart of her target, yet never coming across nearly as hateful or frigid as her family would have you believe, is a performance worth seeing on its own. 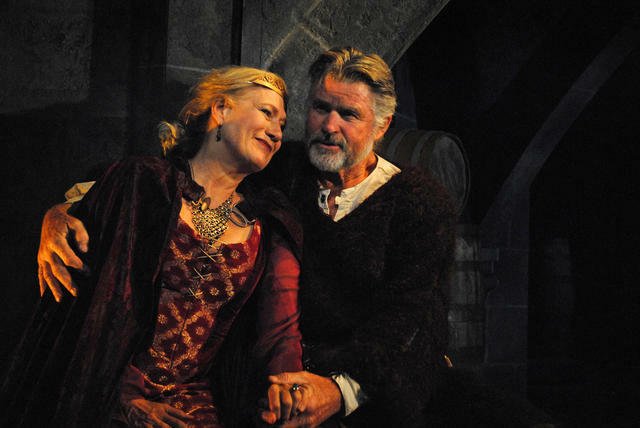 Paired with Treat Williams’ King Henry, the two crackle with history and chemistry. There was love there, under the threats and the lies and the affairs, there was love and perhaps there still is. As the family plays each other, creates partnerships and strikes deals, the audience is on the edge of its seat following these antics wherein the only goal is to win. Going through the motions of celebrating the Christmas holiday, they tear each other down as the holly goes up. And yet, the audience never loses sight that somewhere, under it all, there is a small current of love -- buried but enough to keep everyone in the same room. "The Lion in Winter" is an exquisite production, impeccable pacing and just a whole lot of fun. Berkshire Theatre Group has been around for almost a century, and this is just another example of why that is.